Add some light to your evening parties, celebrations, holidays, Summer camping in a bar and restaurant with this light-up flashing soda cup. Just press on the switch underneath the glass to activate a multicolored light show. At each press you can choose between three different modes; constant, and alternating flashing. The base of the soda cup is removable for easy cleaning. 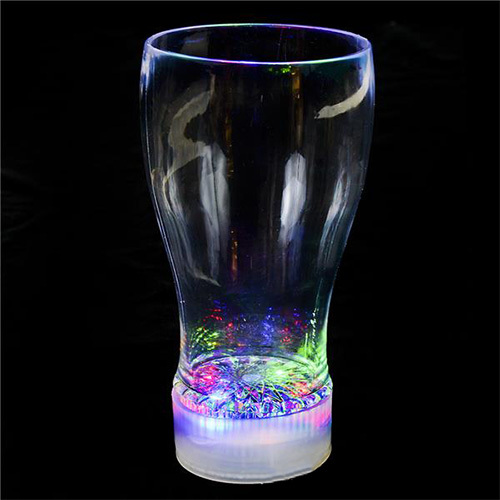 This light up soda cup is 10oz and is made of strong plastic and has rotating multicolor lights. The LED light soda glass has 3 AG13 batteries included and replaceable. This light up cup is great for themed parties. It is sold individually and measures 6 inches tall X 3 inches in diameter and is not recommended for children under the age of 5 years old.